If you intend to travel to Guangzhou China and visit one of the biggest in Asia FEAsia fair for industrial goods, equipment and materials, technics, spair parts, clothes and many other stocks you may use our system to book online a business hotel in Guangzhou, China. We offer wide selection of hotels located near Pazhou complex / Canton fair f rom different star categories and rates levels. For all first time Guangzhou visitors we would like to recommend making reservation for a hotel near the exhibition center, even on higher price. Very often travel agents offer travellers to book a hotel in neighbour to Guangzhou cities like Shenzhen, Dongguan, Foshan and others with organized transportation to Canton fair. If you book this way you will all the time depend on transportation. No matter what is advertised, busses from hotel to Canton fair are twice a day – once in the morning and once at the afternoon, so if you miss your bus all responsibility for the way back for example its your own. Also there is not much to see in the mentioned cities and you will have to spend the rest of the day staying in the hotel room or the lobby. As we all know best located hotels are more expensive, but many hotels in Guangzhou downtown offer free transfers from / to Canton fair for their guests. 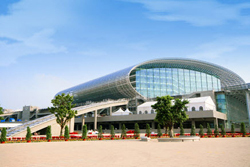 This way you may book a hotel within Guangzhou city limits even far from the Canton fair. Transfers are organized by hotel’s minivans, busses and cars for free and they circulate non stop at all the time so you can return to your hotel whenever you wish. Also taxi services are not expensive and for USD 20.00 you can cross the whole city. Guangzhou is very big and modern – especially the central area. The rest of the day you can spend to look around the city center, make some shopping visit Guangzhou bars and etc. All cases, booking a hotel within Guangzhou city limits is a better option than other neighbour city hotels. 1. Do I need visa to enter China ? – Yes, you need visa and also please mind that very often visa is being issued with a number of entries so if you intend to visit Hong Kong for example between Canton fair phases you better apply for a multi entry visa, not single entry visa. 2. How do I get in to Canton fair? - The best and fastest way is to have an invitation. If you do not have invitation at the entry of exhibition center Pazhou complex you will have to queue up and register as a visitor. 3. What documents do I need to enter the exhibition center? - You need to have your passport with you, a passport size photo of you and a business card. Entry is free of charge. 4. Can I register online as Canton fair visitor ? - Yes, first time visitors click here and fill in the required information. You should receive your invitation to the provided e-mail. Returning visitors click here to re-register for Canton fair. Canton fair is separated in 3 phases.